Washington, DC | www.adc.org | February 15, 2018 | The American-Arab Anti-Discrimination Committee (ADC) is proud to join the global solidarity movement to #FreeAhed, a Palestinian child prisoner unjustly detained by Israel. We ask our members to contact their representatives and call on them to petition U.S. Secretary of State Rex Tillerson to demand Israel release Ahed Tamimi without delay and end the imprisonment of Palestinian children. Take Action: Tell Tillerson to Call Netanyahu and Demand #FreeAhed! On December 15, 2017, Ahed Tamimi was part of a demonstration in the occupied West Bank trying to stop the expansion of an illegal Israeli settlement on her family and village lands. Israeli occupation forces fired rubber-coated steel bullets at the demonstrators. After Israeli soldiers occupied the Tamimi home, Ahed attempted to expel two soldiers from the family’s property. Ahed slapped one of the armed soldiers, an incident captured on camera. Israeli forces arrested Ahed in her bedroom late at night on December 19, 2017. She has since been held in detention awaiting trial in a military court that has a 99.7% conviction rate. 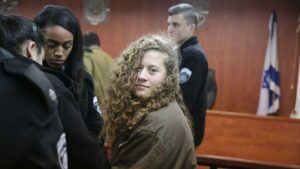 Ahed has been indicted for assault, incitement, and throwing stones and faces up to 10 years in prison; she has been denied bail even though she has never been indicted before and is not a security risk. 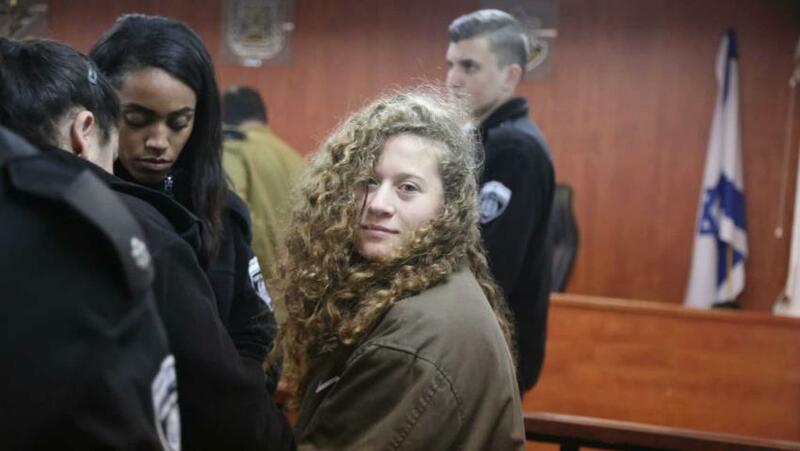 On February 13, 2018, at the start of Ahed’s trial, the military judge banned the press. In the words of Ahed’s father, Bassem Tamimi: “The Israeli military occupation does not want diplomats, human right organizations, and the press to see and witness the ugly face of the Israeli military occupation.” Afterwards, it was announced that the trial would be postponed. Two weeks ago, Ahed celebrated her 17th birthday behind bars. In detention, she endured aggressive interrogations, sometimes at night, and threats made against her family. There is nothing Ahed Tamimi has done that can justify the continuing detention of a 16-year-old child. Unlike the leniency often shown to [Israeli] settlers – even those who slap Israeli soldiers – the prosecution is throwing the book at the girl. Activists have rallied to Ahed Tamimi’s defense demanding that Israel immediately release her. The spirited action of ADC members is needed to further raise awareness about the unjust imprisonment of Ahed and all Palestinian children and demand that Israel free them all!